Tamil Nadu hosts innumerable magnificent marvels. From natural beauty to man-made surprises, the state has everything in its pocket. Set your feet on this land dotted with heritage cities and perennial beauties and be awe-inspired. Mahabalipuram is one amongst these priceless wonders in today's era. Also known as Mamallapuram, Mahabalipuram is a beachside town located in the Kanchipuram district of Tamil Nadu. The history of this town dates back to 7th century during the reign of Pallavas. Today, it has become one of the major historical towns in India with its name on the list of the top UNESCO World Heritage Sites. Famous for its temples in the form of chariots, rock-cut sculptures and ancient temples, Mahabalipuram is assuredly a historical gem. How about planning a trip to this prestigious town and exploring the dense caves of its history? As Mahabalipuram experiences tropical climate, the temperature and humid conditions are not favourable during the summer season. Therefore, it is advisable to not visit Mahabalipuram from April to September. The ideal time to visit Mahabalipuram is from November until the end of February on account of its optimum climatic conditions, which will let you roam around freely and comfortably. By Air: If you are travelling to Chennai by air, then you can take a cab from the airport to Mahabalipuram or take a cab to Chennai city and then take a bus to Mahabalipuram. The Chennai airport is the nearest airport to Mahabalipuram at a distance of 55 km. By Rail: There are no direct trains between Chennai and Mahabalipuram. However, you can catch a train from Chennai to Chengalpattu and then from there take a cab to Mahabalipuram. Chengalpattu is at an approximate distance of 28 km from Mahabalipuram. By Road: Situated at a distance of 57 km from Chennai, Mahabalipuram is easily accessible by road from Chennai and other major cities. You can either take a cab from Chennai to Mahabalipuram or catch a bus directly from Chennai to Mahabalipuram. If you are commuting on your own, then you can take the following routes. However, route 1 is fastest and hence, preferable. Situated at an approximate distance of 40 km from Chennai and built during the era of Carnatic Nawabs, Kovalam was developed as a port town. It is also spelt as Covelong. Famous for its virgin beaches and untouched atmosphere, Kovalam is gaining popularity amongst offbeat travellers for its spectacular beauty. You can see people windsurfing and enjoying the roaring water of the beach. If you are looking forward to stopping your journey for a few moments to relish wonderful surroundings, then this place should be your stopover. While on your way to Mahabalipuram, you can take a break at Thiruvidandhai and enjoy hundreds of crocodiles resting and crawling around at Crocodile Bank. If you are a crocodile lover, this place is definitely your destination. Here you can see endangered species of crocodiles, such as mugger, gharial and saltwater crocodile. Once you have reached Mahabalipuram, you are free to spread your wings and explore the marvels of the town. Following are some of the major places which should be on your must-visit list if you are travelling to Mahabalipuram. 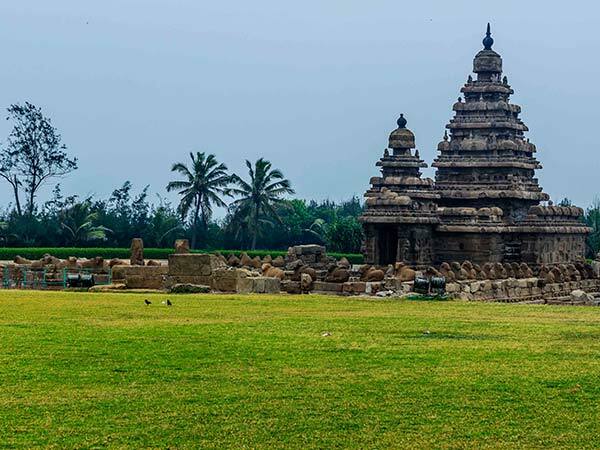 Unarguably, these remarkable sites have placed Mahabalipuram in the list of World Heritage Sites. Nestled along the shoreline of the Bay of Bengal, Shore Temple was built in the 8th century with blocks of granites and it is believed to be one amongst the Seven Pagodas. It is also one of the oldest rock-cut structures in India. The carvings and the patterns on this complex of temples clearly showcase its authentic beauty. If you desire to sit by the shore to explore the hidden charm of this temple, then Shore Temple is a must-visit place in Mahabalipuram. Also known as Descent of Ganges, it is one of the oldest monuments in the town and the relief work done over this rock is incredible and definitely one of the best-ever relief works. The portrayal of descent of the Ganges and Arjuna's penance makes this unimaginable art creative and sublime. It was created during the medieval period to celebrate the triumph of Hinduism over Buddhism. How about paying a visit to this marvellous place? Another elegant piece carved out by a mastermind is Pancha Rathas. These are five monolithic pyramidical structures named after five Pandavas of the epic Mahabharata, which are generally temples in the form of chariots. The major speciality of Panch Rathas is that this whole complex is carved from a single piece of stone. Why not visit this sheer form of artistry and get astounded by its appeal? A huge rock resting on a slope is the mystical Krishna's Butterball. There are several stories attached to the displacement of this gigantic rock ball. It is believed that once a Pallava king tried to displace this stone using seven elephants; unfortunately, the rock retained its position without slipping even an inch. If you want to hear local stories related to this giant, you must visit this town to find yourself surrounded by amazement at every step.